This is a kit for those who just want a simple life! It has all the benefits of an e-liquid-based vape kit (long-life battery, bigger clouds), without the mess of needing to pour and refill the clearomizer. 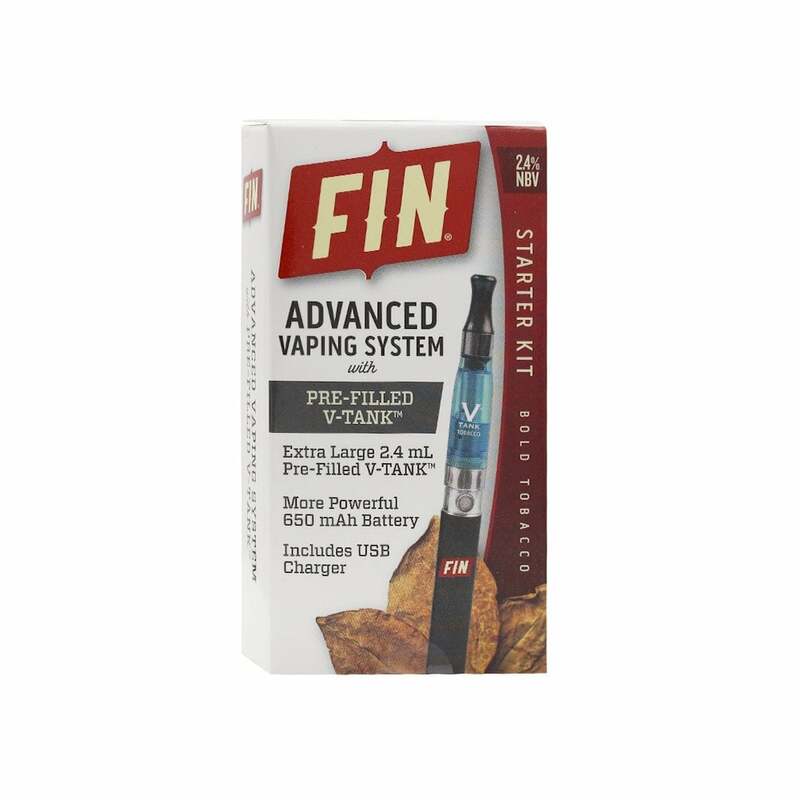 The AVS Kit by FIN Cigs uses pre-filled FIN V-Tank refills (available here), cutting out the fuss and making your vaping experience altogether simpler! The kit comes with e-liquid in the box, but when you add this product to your basket a number of optional extra e-liquids will be offered to you. Any of these will work just fine with the kit. GREAT FLAVOR, EASY TO USE! Very happy with the durability of the battery for being a smaller vape. I'm not happy with the bold flavor, but I use the battery with a different flavor. Very happy for the price. The unit died on me in 15 days. I charged it the light was green but could not vape from it. I tried the Njoy pre-filled and the Fin Pre filled the unit. I wrote in and am hoping to have it replaced. Feels and tastes exactly like a regular cigarette without the smell, or mess. I love it. I kicked the cigarette habit in 2015 with the help of the FIN Vaping system. I'm now addicted to that but it's much better than the stinky messy dangerous habit of smoking. Couldn't have done it without you. At first I received some damaged products no fault of Tobacco - it was the product mfg. and Etobacconist's were very good about give me credit. I only had to send photos of the damaged files the first time and if I receive any subsequently it's minimal. No side effects. Again I could not have quit so abruptly without this product. I went cold turkey, stopped after 40 years. That's one less health issue to worry about. I feel better too. I'm happy with the vape system. My only complaint is the mouth piece doesn't stay on tightly. Great experience. I have been using this product for some time. I received it very fast and the value was great. Thanks!